"Brokeoff Mountain (Lassen National Park)"
Mount Tehama or Brokeoff Mountain is the second highest peak in Lassen Volcanic National Park and connects to the park's highest point, Lassen Peak. Tehama started life some 600,000 years ago. A combination of hydrothermal activity and erosion, particularly by glaciers during ice ages, removed the central cone of the volcano, leaving a large caldera, the northern edge of which can still be seen. For sheer beauty and rugged mountain scenery the Brokeoff trail is one of the best in Lassen. The trail climbs steadily through open meadows and forest for two miles and then through scattered hemlocks and finally above timberline to the top. At the west end of the mountain just before the last half mile of the climb, there is a good view of Mt. Shasta. From the top of the mountain there are good views of Lassen Peak, Conard, Chaos Crags, Diller, Shasta, and other mountains of the vicinity. The view of the old Brokeoff Volcano (Mt. Tehama) caldera is excellent from the summit. The trail is considered one of the toughest in the park, though also one of the most rewarding. PaulB's Pointillistic/Impressionist original oil paintings of California Mountains and various prints and poster formats of a wide variety of subject matter by the Pointillistic/Impressionist oil painter from landscape/waterscape paintings, dance, sports, portrait, to classical figures, flowers, rock and roll, Brazil, and California Mountains paintings and prints are available for purchase for as little as $24.95 for an 8" x 10" matted print on photo pape. 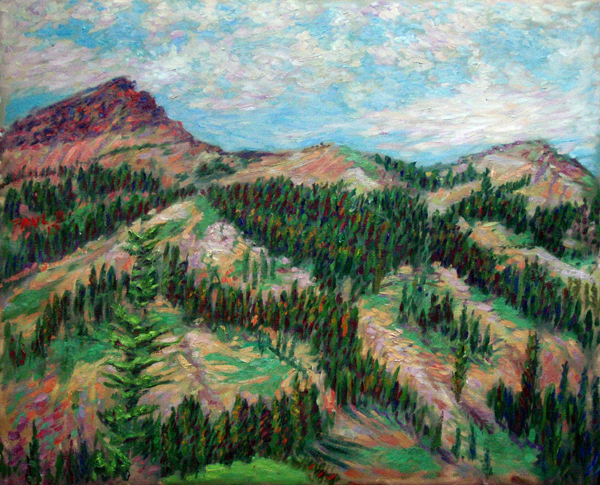 Pointillistic/Impressionist Giclee prints of California Mountains on real canvas or heavy watercolor paper are available. One of a kind California Mountains embellished prints, which are Giclee prints retouched in genuine oil paint by PaulB. Unless noted PaulB's original Pointillistic/Impressionist oil paintiings are oil on canvas. Paul Berenson's pointillistic/Impressionist oil paintings are in privale collections around the world, including the downtown Los Angeles Athletic Club and have appeared in numerous publications, including the New York Philharmonic Playbill. PaulB.com also builds websites and PaulB is a member of the LA Web Professionals Group.